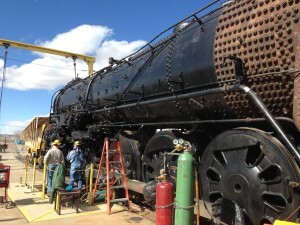 LEAVING THE GROUND IN NEW MEXICO – the sky’s the limit! New Mexico is the place to go if you want to get off the ground. Last week-end we went to the glider field at the Moriarty Airport, 50 miles from Albuquerque. There we saw dozens of gliders and several tow planes. A 15 minute glider ride from Sundance Aviation costs $105 and you fly with an FAA approved, experienced pilot. The only downside is that you have to weigh less than 220 pounds and be under 6′ 5″. Near by is the US Southwest Soaring Museum which unfortunately was closed on Sundays. Trike Flights – This is an air tricycle. You can get a 30 minute ride for $100 with a licensed Sport Pilot. For an additional fee you can have a video made showing you in flight. I frequently see these mechanical trikes while I am walking along the Rio Grande. Plane rides at Vertical Lift Aviation. Parachute jumping. Starting at $375 with Albuquerque Sky Diving. Hang gliding with High Desert Hang Gliding. All near or in Albuquerque and while I have only taken a balloon ride, the others have intrigued me. I have not taken any but the hot air balloon ride, an Albuquerque must, but am intrigued at 77 and sorry that I missed them earlier in my life. I am toying with the glider ride. More my speed is the Sandia Peak Ski & Tramway which will take you on a 2.7 mile tram ride to the top of Sandia Peak from Albuquerque. There is sking, a restaurant and great hiking. At your age, watch the altitude which is over 11,000 feet. You can always sit in the restaurant and enjoy the view with a glass of wine. The big draw in and over Albuquerque is the Albuquerque Balloon Fiesta held for a week every October, where up to a 1000 balloons participate in a mass ascension, among other events. And of course, there are hot air balloon rides then and the year around. The traffic is horrible, but if you have an RV, there is great RV parking next to the grounds. Balloon pilots and their chase crews are hard to keep up with at my age, especially in the evening. There is also the Anderson Abruzzo International Balloon Foundation Museum. 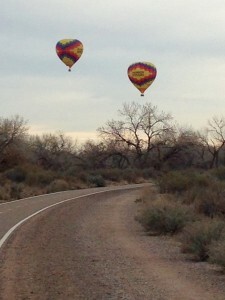 Most mornings I can see hot air balloons following the Rio Grande River behind my home, which is about my speed. It is worth soaring above the New Mexico desert, there is no age limit, and it gives you some great stories and pictures to impress your grandkids with. On Friday, January 26th, 2017, I followed hundreds of bison being rounded up on Ted Turner’s Ladder Ranch, near Truth or Consequences, New Mexico. The tour was sponsored by Ted Turner Expeditions and was the 2nd annual Bison RoundUp. The tour part of the roundup lasted for 2 days and the bison on the 250 square mile ranch had been collected over the last several months. This was the last collection of bison and herds of 200 to 500 bison were driven into pens where they would be weighed, tagged and checked before being released. The roundup lasted about 5 hours each day and involved 4 cowboys on horseback and 4 on ATV’s keeping the bison in line. The bison followed a truck that they mistook for a feed truck. Behind the herd, 15 of us who had signed up for the tour watched from ATV’s. The 28 Turner Ranches are home to 51,000 bison. The roundup is not advertised and will become an annual event. I received an e-mail invitation since we had stayed at the Sierra Grande Lodge in T or C, New Mexico, which is owned by Turner. The first class restaurant serves bison and the Lodge has natural hot springs spa tubs available to guests along with massages. Turner Expeditions offers numerous other tours on the various ranches; all directed toward conservation and the preservation of natural habitats. 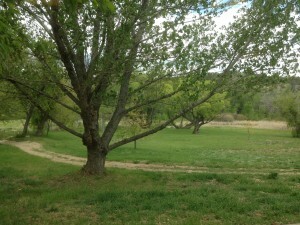 The Ladder Ranch has no paved roads, is 29 miles from T or C, and is near the Amadaros Ranch, another Turner Ranch. It is also near the NM Spaceport and Elephant Butte Lake. There are several vineyards that produce good wine. Turner’s Vermejo ranch is in Northern New Mexico, near Philmont Scout Ranch, where I first ate Bison in 1955. The cost was $175 plus tax for a 7 hour day including driving time to the Ladder Ranch. The guides were great and informative – they knew all about the flora and fauna on the ranch and a lot about the history. The bison roundup is fascinating; with real cowboys and bison that are genetically pure . In addition to bison, we saw a 40 Elk in a line and numerous birds. The ranch is a wildlife paradise. I was told that there were about 27 bison bulls for 1500 cows, and that last year all but two of the cows had calves; however, I was unable to verify this. And, of course, if you want to eat bison, the Sierra Grande Lodge serves it. or, it is available at Whole Foods. CHIHULY EXHIBIT AT VANDERBILT MANSION, Ashville, NC – glass blowing gone wild! Dale Chihuly is a glass sculpture who creates large masterpieces of blown glass. I recently visited the exhibition at the New York Botanical Garden where Chihuly’s works were displayed on the grounds. I am at a loss to understand how the glass sculptures can survive in an outdoor, park setting. Chihuly Exhibition at New York Botanical Garden until October 29, 2017. I saw it in the Bronx. This blog is updated as it is now as the Vanderbilt Mansion in Asheville, NC. Visit the Chihuly web page to learn about the sculptor and his works. You can find Future exhibits at this location. The exhibit opened at the Biltmore in Asheville, North Carolina on May 17, 2018 and will run through October 7, 2018. If you are in New Mexico, there are two Chihuly works in the dining hall at United World College in Montezuma, New Mexico. UWC is also interesting, located in a renovated Castle built in 1881. UWC is worth a visit and the idea of a castle in New Mexico that is more than 100 years old is something to think about. The exhibits and the collections all seem to be in places that are interesting on their own, even without these exhibits. This post had to be edited to announce that Sparky’s won the Green Chile Cheeseburger Challenge at the New Mexico State Fair. 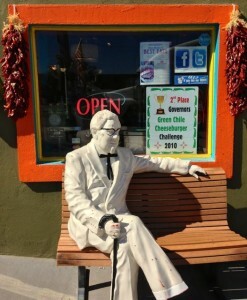 Sparky’s is the place to stop in Hatch, NM. It is just off I-25, 185 miles South of Albuquerque, NM and 38 miles North of Las Cruces, NM. The population is 1673; with 12.3% over 65. 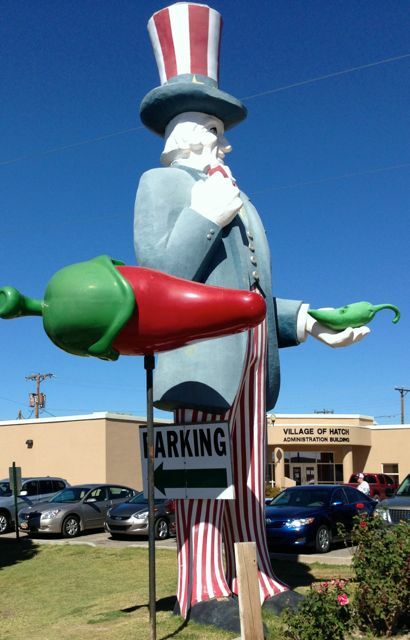 Thirty Thousand people show up on Labor Day for the Hatch Chile Festival. 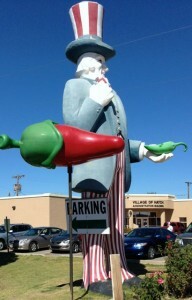 Hatch green chile is known throughout the Southwest and can be found in any New Mexico grocery store. 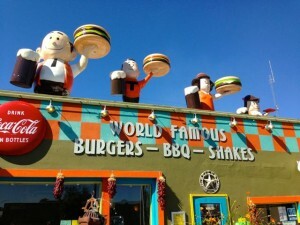 Sparky’s is a great stop if you are going from Albuquerque to Tucson and taking the Hatch-Deming by-pass to I-10. The by-pass passes huge dairy farms, a solar farm and a wind farm, not to mention cattle ranches and fields of green chile, and of course the omnipresent immigrant check-point. Sparky’s has collected every large fast food statute that you can imagine and has placed them along the highway and around Sparky’s. You can order the green-chile cheese burger and have it cut in half if you are old; or, even if you are not. The geezer is a big advocate of shared plates. You order/pay at the counter and find your own seat. It may be outside or next door where there is a stage, sound equipment and the largest collection of cookie jars that I have ever seen. If you are over 70, it is nostalgaville. Things you haven’t seen since the 40’s. On Friday, Saturday and Sunday, they have bands you never heard if you are over 70, playing country and the blues. It is closed on Mon, Tue and Wed. so plan your trip carefully. You might think that you would be out of your comfort zone at Sparky’s; but take it from the Geezer, you will feel right at home. The Geezer is an advocate of leaving your comfort zone, as long as it doesn’t hurt. Beats the usual turnpike fare. The Albuquerque Journal announced that the Pecos Benedictine Monastery was having an open house. I attended and discovered a quiet place to visit. It has about a dozen monks and numerous volunteers. They support themselves by holding retreats and by allowing private retreats. Look at their web page; pecosmonastery.org. Trappist monks bought the place in 1947. It has been transferred to several religious orders since then ending up as the Our Lady of Guadalupe Abbey today. Our Lady of Guadalupe Abbey at Pecos, NM. 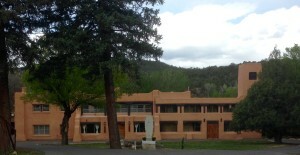 The Abbey is about 20 miles from Santa Fe, NM in the small town of Pecos. The Catholic Church in Pecos dates back to 1862. This is rural Northern, New Mexico, midway between Santa Fe and Las Vegas, NM. There are numerous guest rooms, several chapels, a library and of course friendly monks. There is a common room with wi-fi and they have the necessary equipment for retreats. The bedrooms are simple, but fancier than what I imagined a monk’s cell to be like; having seen a few in Europe. They have private baths, a desk and a closet. No phones, no TV’s; just the simple basics. This is a monastic place. 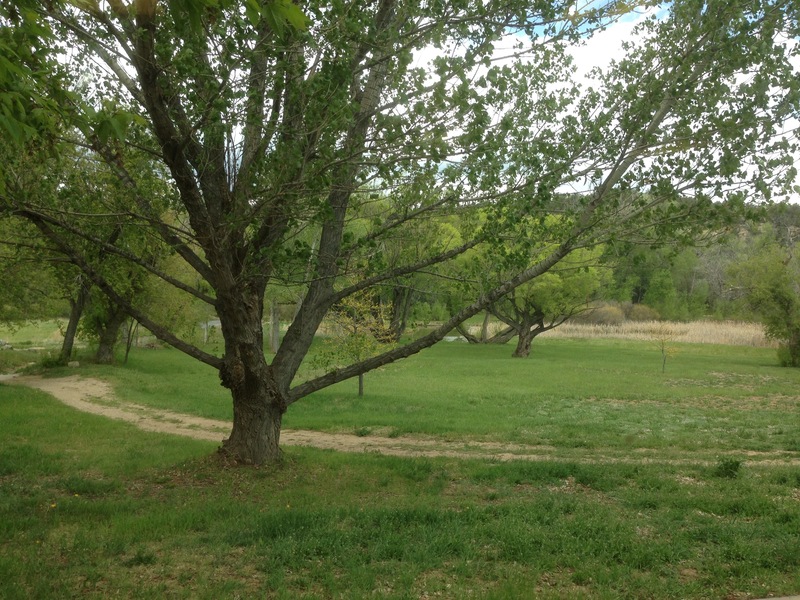 The Abbey has 1000 acres; of which about 4o can be planted and used for buildings. That leaves about 960 acres along the Pecos River for contemplation. Grounds at Our Lady of Guadalupe Abbey. 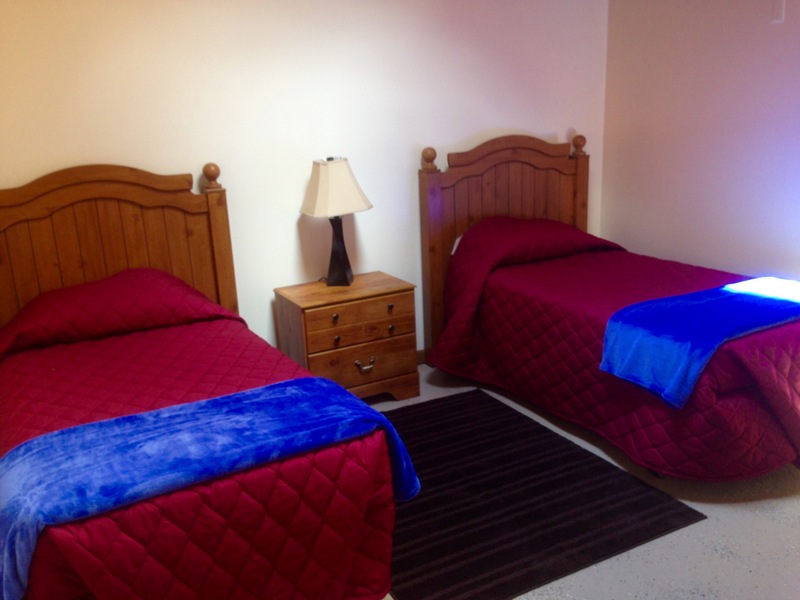 We did not stay overnight; however, if you want to and if you take the AARP discount, it is $67.50 per night and that includes three meals and all the quiet you want. There are common areas with WiFi and each room has a desk. It will be a great place to get caught up on a blog. It is not for everyone; however, if you are the geezer’s age, overwhelmed by this electronic society, and looking for a new social setting, there is something relaxing about the place. I couldn’t help but compare it to long-term care facilities that I have visited; and, at some future point, if they would have me, I would much prefer to live at the Abbey, rather than an in-town assisted living facility. There is plenty to do and it might give some purpose and meaning to the end of life. Anyway, you might want to try it; or any monastery. Most take guests, even in Europe, and they are all over, need the money and certainly need volunteers. An old book that I like is: A Guide to Monastic Guest Houses, 2nd Edition by Robert J. Regalbuto which is available on Amazon. And, if you are really interested, some of the Refugios that I stayed in when I walked the Camino de Santiago are in monasteries.